It’s an adrenaline rush mixed with an abundance of emotions and feelings. There’s excitement, nervousness, anxiety, surprise, frustration, pride and satisfaction. The list can go on and on. But all of them are bundled into one experience … what we refer to as the onsite experience. You’ve put in months of planning and racked up sleepless nights that pushed your endurance to new levels. And if there’s one thing you know for certain, regardless of how many cycles you’ve gone through to finalize those nitty gritty details, inevitably, things will end up changing onsite anyways. And so the moment is here. Time to stop fixating on changing around floorplans and shifting around the agenda. Print that final show guide and runsheet, make those final reminder calls, close the computer and hope for more than 4 hours of sleep. It’s here and you fuel your tank with three cups of coffee and let it all unfold. Yes, it’s finally happening – there’s no more time left to change concepts, move numbers around in the budget, tweak PowerPoint presentations, or change the “FIFTH_FINAL” F&B numbers or Agenda FINAL_FINAL. It’s show time! On our team we call it the event hangover when all is finished and you wave good-bye to the last guest. So what is it about the onsite experience that makes us start over again, planning the next one. a) The “Do Not Disturb” – You’ll know your onsite lead is “in the zone”. They are so deeply focused on juggling multiple vendor set-ups, handling client change requests and ensuring a seamless check-in process for attendees that you just know you’d better not interrupt. Let them do their thing. b) The “Almighty Zen” – This onsite type is of course also deeply focused on the tasks at hand, but they do so with a very calm approach, so calm that you try to rethink if the term “stress” even exists in their behavioural dictionary. You sometimes wonder with the Almighty Zen if they have an invisible secret weapon, a shield of sorts, that powerfully fights off the stress bug up to a 15 mile radius. Behind the impressive façade of the sights and sounds of a successful event, there’s a lot of mechanics at work which attendees (and clients) don’t see. Nor, do they ever need to. As events professionals we do our best to land at a happy medium between the “Do Not Disturb” and the “Almighty Zen”. It’s your personal super power, you are able to control the perfect dosage of stress, allowing it to fuel you. A great event lead knows their vendors are an extended part of their team and treats them as such. Don’t forget your vendors. They are vital stakeholders in making your event a success. Remember that they too are experts in what they do and that’s why you chose them, so let them do their thing with the comfort of knowing they will help create a flawless event for you. The event will be as high stakes for your client as it is for you. Keep a safe boundary between the logistics of the event and how much your client should be exposed to. Remember that thing called stress that we talked about? It’s our job to keep our clients’ minds at ease, amplify their brand, and “wow” their customers with those high-touch impressions. If an attendee is complaining that the food is too cold, and another attendee is complaining that the food is too warm, just connect with one of your event vendor bestie’s, and don’t pull your client away from a conversation with a customer to let them know. A good event plan means you’ve assigned your team to the right roles. And your team will be like a machine going into perfect motion. Registration glides smoothly in place, the stage constructed, rehearsals tick along and the venue lead is one step ahead of everyone, readying for the guests. And with your detailed master schedule, you know each team member is well informed of the intricate onsite dance that will take place. You will definitely learn new aspects about your team members, it’s also a great team-building opportunity with plenty of stories to share for months and sometimes years to come. Hold a final briefing session with the client. When the planning period gets extremely busy in the final days leading up to the event, the bigger picture can get lost. It’s imperative to regroup and review how the event will be extraordinary and take them through your final show guide. Do this and you’ll avoid everyone running off and giving opposite orders to vendors, the venue and crew! Conduct a final tie-down meeting with the venue. This is where you’ll meet the entire venue team: The front desk lead, concierge, housekeeping, catering and so on. These are your go-to people. They’re poised and ready to make your event stand out. Plan ample time for set-up and schedule your vendor arrivals and set-up accordingly –make time be a luxury, and take full advantage! It never hurts to be too prepared and allow for glitches to happen during the move-in process that won’t derail your event. And it sure helps if changes come up during set-up versus the middle of the event! Eat! We have a joke on our team, as long as there’s food (and chocolate) and constant wi-fi connection we can work through anything! 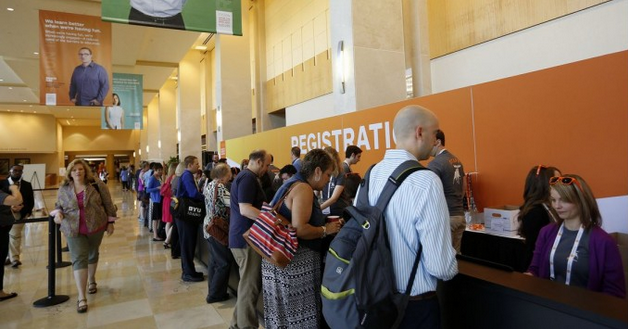 Test your registration process BEFORE attendees arrive onsite. Don’t let it be a surprise at 7 in the morning when guests start arriving to understand how things will flow. Be prepared for glitches and a mass rush, even if they don’t happen. There’s a lot of work that goes into executing a successful event, but a great event lead won’t be the one in a fetal position in the corner as things unfold onsite. Even if at times you’re sure you’ve become a magician, literally pulling a bunny out of a hat to liven up the mood! Just kidding. If only it were that easy. At the end of the day, the results are the most important part. It’s what keeps us coming back for more. Seeing your hard work come to life and the positive impressions you create for your clients is what makes it all worthwhile in the end! Give yourself a pat on the back afterwards, and heck break out the bottle of wine. You deserve it.